Adult’s size tables and chairs, rectangular and circular, delivered into the London area. Click here for more details. 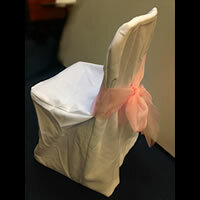 Welcome to The London Party Tables and Chair Hire service offered by The Balloonworks in Kew. Our mission is to make throwing a party or organising a special event stress free by offering quality table and chair hire without the hassle. We’ve even got a range of party table accessories to help you decorate for the occasion and make your event go with a bang! 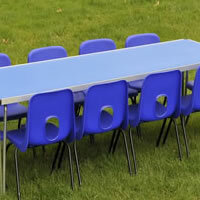 We have a great range of party tables and chairs to suit any occasion. For adults, we offer a choice between round tables or long tables. We also cater for children with smaller sized tables that will give younger guests their own space and reduce the stress of any spillages. All of our tables and chairs are modern, simple to erect, and easy to clean. They’re also easy to decorate for your occasion. As well as offering party tables and chair hire in London, we also have a wide range of party table accessories for sale. 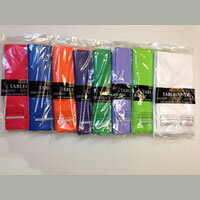 Choose from brightly coloured tablecloths and napkins, printed napkins, party poppers, party cups, and even bubble machine hire. You will find plenty of party decoration inspiration over on the party table accessories page. 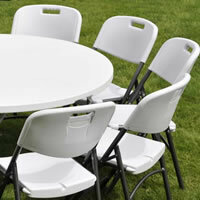 Customers hiring party tables and chairs can collect and return the tables and chairs themselves at no charge. However, it is important to note that a suitable vehicle is required.We also offer a delivery and collection service which is available in the Greater London (M25) area. Prices for this service are charged by postcode and start from just £5. If you have any questions regarding our products, please don’t hesitate to contact us. We’re dedicated to making sure your event goes smoothly and will do everything we can to satisfy your needs and give you one less thing to think about when organising a special celebration. Decorate your event in style! We have balloons to suit every event and occasion over on our sister site. From latex or foil printed balloons, to balloon decorations, you’ll be blown away by our wide range of personalised options. Why not use us for all of your event needs? Need balloons for your event?